Culturally sensitive art education practices aim to develop individuals who have deep appreciation for the aesthetic beliefs and artistic expressions of members of their local sociocultural communities, yet at the same time exemplify openness, respect, and a sense of mutuality and caring responsibility for those from other communities around the world. 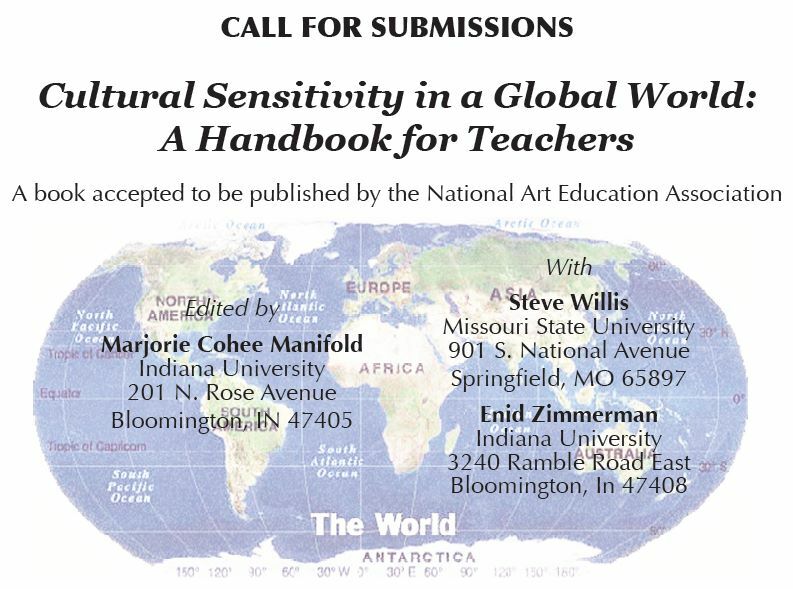 The focus of this handbook is on best teaching practices, assessment procedures, and resources that support student learning through promoting cultural sensitivity and participation in a globally interconnected world. Teachers of kindergarten through postsecondary grade students and those who teach in out-of-school contexts in museums and other settings are encouraged to submit reports of individual or group projects, descriptions of instructional strategies, or model units and lesson plans designed to foster appreciation, initiate interactive communication, nurture empathy, and/or promote mutual respect among people from diverse socio-economic, gender, ethnic, national, and cultural groups. The deadline is changed to November 15, 2011 for E-mailing one to two page double spaced abstracts of proposals for chapters to be considered to be included in this handbook.